ILLEGAL HARVEST While California gets it cannabis-legalization house in order, state and local law enforcement are in flux, too. When downstate Democratic congressman Ted Lieu introduced an amendment earlier this year to slash funds sent to the Drug Enforcement Administration devoted to cannabis eradication, he had Colorado in mind more than California. Lieu, a frequent and outspoken critic of President Donald J. Trump on a range of issues, offered his budget amendment to address "a pretty idiotic scenario" in Colorado, says Lieu's chief of staff, Marc Cevasco. "You have taxpayers who are paying to fund two sides of a battle over marijuana," says Cevasco, as the legalization-leader state of Colorado angles to reap a pot-tax bonanza even as the federal government has set out to kill the very plant that would contribute to the state tax coffers. Trump, says Cevasco, has ceded the question of a cannabis crackdown to Attorney General Jeff Sessions, "and [Sessions] has been kind of militant about it, and it seem like it's getting worse and not better." The enforcement-agencies-at-odds dynamic plays out in Lieu's home state, too, and highlights a harvest season irony in the post–Proposition 64 era in a state where pot politics and eradication priorities are decidedly in flux: counties in California continue to accept DEA eradication monies, but now it's to help support the California push on legalization—even as the DEA is committed to holding up a federal ban on medical and recreational cannabis use. Huh? The success of Proposition 64, which legalized recreational use of cannabis for Californians and will be fully implemented in 2018, is predicated on a robust law enforcement eradication of black market cannabis in the state. Counties from Sonoma to Siskiyou continue to accept DEA funds devoted to eradicating cannabis, even as the state as a whole has legalized a plant that remains illicit under federal law. 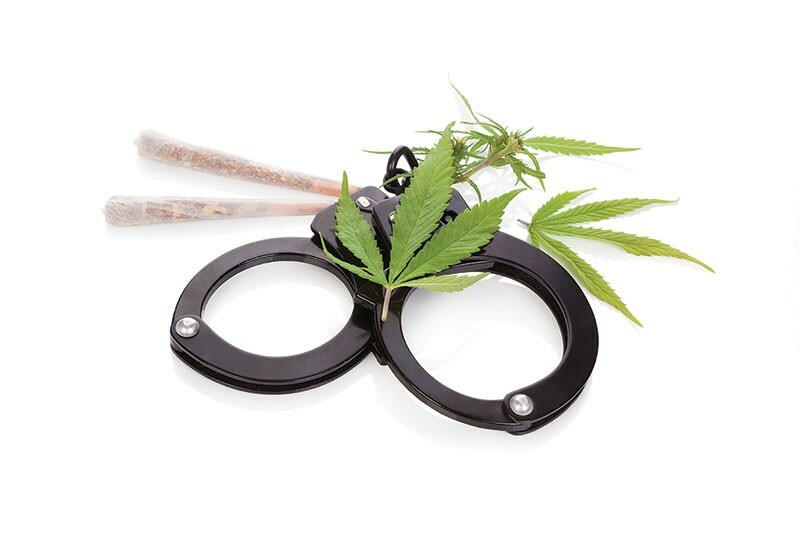 Recently, the DEA was a lead agency in a series of Sacramento raids in July that yielded 7,500 illegal plants grown indoors, plus some weapons, as reported by the Sacramento Bee. Is the DEA's presence in California actually helping the state clear out its illegal grows to make way for legalization? "It's a fair point, an interesting development," says Cevasco with a laugh about the federal-state push-pull. "In an ideal scenario, we'd all be rowing in the same direction. If the DEA is actually assisting the state of California to set up a legal marketplace, the congressman would approve of that. In a weird, ironic way, this is kind of divine justice." Lieu's amendment sought to extract $16 million in cannabis eradication funds, says Cevasco, out of a Department of Justice budget that comes in at around $300 million annually. Cevasco says that while Lieu's effort was essentially a symbolic exercise in futility—given the DOJ's discretion in how it spends its budget—his amendment did pass the House with support from liberal Democrats and right-leaning, self-identified "strict constitutionalists" as well. He says it's "a strange alliance," that has yielded some nonbinding victories for pro-cannabis constituents. "The goal is to defund the cannabis-eradication programs," he says of the Lieu amendment, which passed with support from House Speaker Paul Ryan, R-Wisconsin, and Cevasco says that in the best available light, the effort may build some momentum for next year's budget fight—which will take place after California has launched full-throttle into legal cannabis. But eradication of the black market is a key piece to a successful rollout of legalization in California—even as the black market will likely continue to feed the cannabis-consuming beast that is most of the United States. Generally speaking, in order for legalization to work, the price of legal cannabis can't be higher than black market cannabis, for the simple reason that people will buy cheaper weed when they can. State lawmakers, such as Mike McGuire, D-Healdsburg, who has supported the thrust of Proposition 64, have also pushed for an end to outlaw grows. McGuire has many such grows in his district, which comprises the Emerald Triangle. The illicit grows pop up on occasion along the banks of creeks that support endangered species, most notably the coho salmon and steelhead. A spin through recent eradication-related headlines reveals a lot of cross-agency black-market eradication efforts going on in the region. • The AP reported in mid-August on a series of raids in Calaveras County that yielded 27,000 plants, conducted by state and county environmental offices, the California Highway Patrol and the National Guard. • A July raid in Willits yielded 2,400 plants, reported the Ukiah Daily Journal, and was conducted by county officials and the federal Bureau of Indian Affairs. • A July raid in Lassen County yielded 1,600 plants and was conducted by local law enforcement, California Department of Fish and Wildlife officials, and agents of the U.S. Bureau of Land Management and the U.S. Forest Service. Fish and Wildlife officials told the Lassen County Times that the raid was undertaken in part because the grow sites were in direct violation of environmental cannabis code set out in Proposition 64.